Malaysia's royal families on Thursday picked a sports-loving sultan as the country's new king after the last monarch abdicated in a historic first following his reported marriage to a Russian ex-beauty queen. Sultan Abdullah Sultan Ahmad Shah, a keen athlete who holds a string of positions on sporting bodies, including at world football governing body FIFA, was elected as the new king during a special meeting of Malaysia's Islamic royalty. 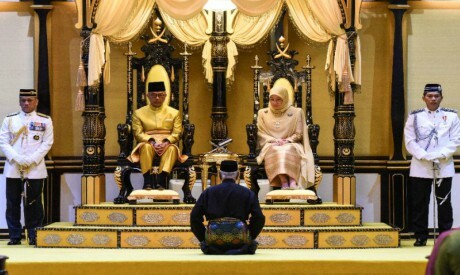 Sultan Abdullah "has been chosen as the 16th Yang di-Pertuan Agong (king) for a period of five years starting from January 31, 2019," said a statement from the Keeper of the Rulers' Seal, Syed Danial Syed Ahmad. Eight of the state sultans earlier met at the national palace in Kuala Lumpur for the so-called "Conference of Rulers" to select the new king. The only one absent was Muhammad V, who remains the sultan of the northeastern state of Kelantan despite having abdicated as the national monarch. The 59-year-old was named Pahang's new ruler -- replacing his elderly, ailing father -- several days after Muhammad V's abdication, paving the way for him to become the next national monarch. The deputy king was named as Sultan Nazrin Shah of Perak state, according to the statement. As well as being a member of FIFA's council -- which lays out the vision for global football -- he is president of the Asian Hockey Association and a former head of the Football Association of Malaysia. After attending school in Malaysia, the keen polo player went on to study in Britain, where he attended the Sandhurst military academy, according to a biography published on Bernama. After Pahang, the next state due to provide a king is Johor. The sultan of Johor, which borders Singapore, is one of the country's most wealthy and powerful Islamic rulers, and has his own private army. To be elected as the national king, a sultan must be supported by at least five of the state rulers. Malaysia's sultans trace a lineage back to the Malay sultanates of the 15th century. The king's official title, Yang di-Pertuan Agong, means "He Who Is Made Lord".